Great Bernera (Scots Gaelic: Bearnaraigh Mòr) is a wee island, by Lewis. ↑ Mac an Tàilleir, Iain (2003) Ainmean-àite/Placenames. (pdf) Pàrlamaid na h-Alba. Retrieved 26 August 2012. ↑ 3.0 3.1 Naitional Records o Scotland (15 August 2013) (pdf) Statistical Bulletin: 2011 Census: First Results on Population and Household Estimates for Scotland - Release 1C (Part Two). 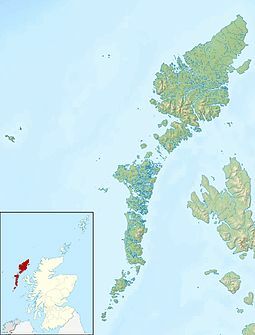 "Appendix 2: Population and households on Scotland’s inhabited islands". Retrieved 17 August 2013. ↑ 4.0 4.1 Haswell-Smith, Hamish (2004). The Scottish Islands. Edinburgh: Canongate. pp. 287–301. ISBN 978-1-84195-454-7. Wikimedia Commons haes media relatit tae Great Bernera. This page wis last eeditit on 16 Julie 2018, at 23:27.